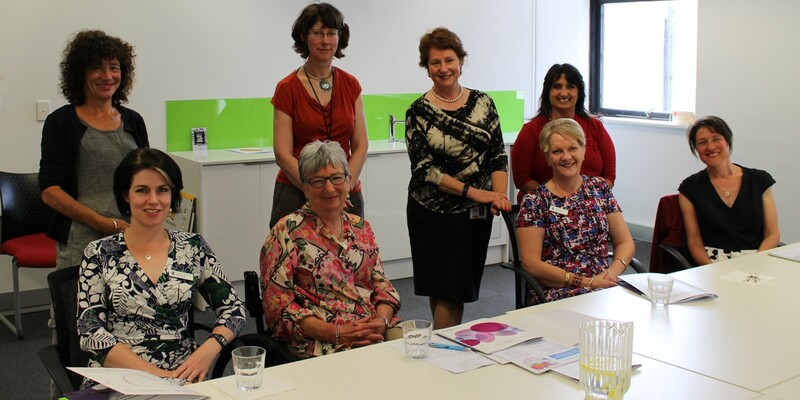 Women with Disabilities Victoria's Board and staff were thrilled to welcome around 100 members to our Annual General Meeting. The AGM is an opportunity to reflect on our year's work and to thank our donors, partners and all who contributed to the year’s success. We also celebrated our 21st birthday as an organisation. Women with Disabilities Victoria was funded in 2004 but the incorporated association was first formed in 1994. The AGM was also a wonderful opportunity to announce the Brenda Gabe Leadership Award nominations and winner (details follow) and energise around our vision for a world where all women are respected and can fully experience life. 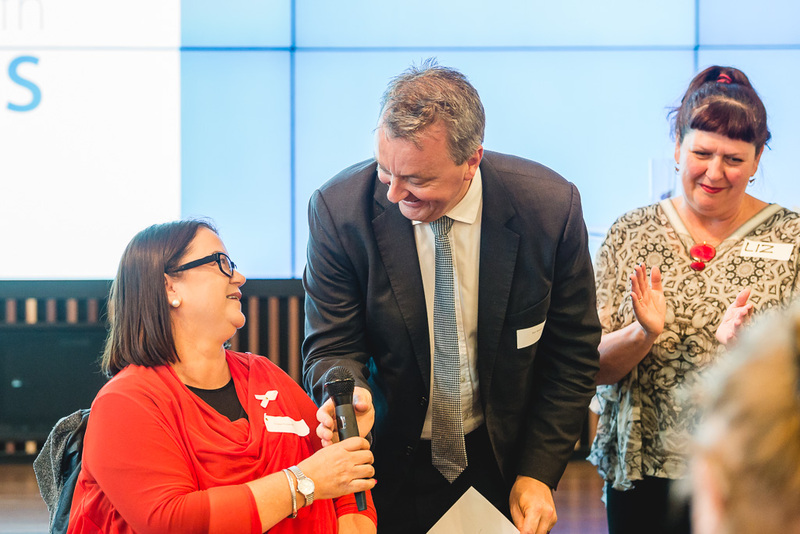 The Leadership Award was announced by the Minister for Disability, Martin Foley, and Liz Wright, Chair of the Disability Reference Group at Victorian Human Rights and Equal Opportunity Commission. The minister addressed the gathering and congratulated Women with Disabilities Victoria on being “an inspiring organisation which should reflect on its substantial achievements and steel itself for the looming challenges ahead”. He acknowledged Women with Disabilities Victoria as “one of Victoria’s leading disability organisations” and suggested the need for such an organisation and the need for women with disabilities in Victoria to have that powerful advocacy voice will only grow. “The Andrews government thanks you and wants to make sure we continue to partner with you in the future”. He particularly acknowledged the outstanding work Women with Disabilities Victoria does on family violence. It is exciting to think about where we will be in 21 years. In 2015 we look around us and can see some signs of gender equality becoming a mainstream issue. It is not hard to imagine that by supporting women with disabilities as leaders, by 2036 women with disabilities will be fully respected in our community. As WDV chair, Marija Groen says, 'with solidarity we can do it.' In the meantime, as the Minister noted, there are many challenges ahead but Women with Disabilities Victoria is ready to take them on. Congratulations to the nominators, the nine nominees for your contributions to building a world where women with disabilities are fully respected. Thank you to Dr Helen Sykes, Director of Future Leaders, for supporting this award. Thanks also to Martin Foley, Minister for Disability, and Liz Wright from the Victorian Equal Opportunity and Human Rights Commission for presenting the 2015 award. PHOTO: Brenda Gabe Award nominees - BACK ROW: Fiona Tuomy, Maribel Steel. FRONT ROW: Fran Henke, Lynne Foreman, Deborah Haygarth, Jax Jacki Brown, Colleen Furlanetto, Simone Stevens, Effie Meehan. The annual Brenda Gabe Award honours a much loved and respected member of Women with Disabilities Victoria.Encouraging other women with disabilities to make a positive difference was very much at the forefront of all of Brenda’s activities. Last year's Brenda Gabe Award winner, Jody Barney, was unable to be at the AGM. However, Tricia Malowney shared a wonderful presentation by Jody reviewing her year with the award. Colleen Furlanetto is the newly elected Mayor of Strathbogie Shire. She is committed to bringing change at all levels for women in the areas of disability, violence and health care. She chairs the Municipal Association of Victoria Prevention of Violence against Women Network. Colleen is also a participant in the acclaimed Williamson Leadership Program. Colleen said, "To be the 2015 Brenda Gabe award winner is a huge privilege. We are in a time of significant social policy change offering many people with disabilities choice for the first time. Violence Against Women with a disability is far higher than for those without disability. To know that Brenda Gabe was a very committed advocate in this space, it is wonderful to receive the award in her name in 2015." PHOTO: Colleen Furlanetto accepting the Brenda Gabe Award with Martin Foley, Minister for Disability, and Liz Wright, VEOHRC. Another big AGM highlight was a review of our 21 years at WDV, with long serving members present, including Margaret Cooper, Karleen Plunkett and Keran Howe. This was a fitting occasion to hear from an Enabling Young Women Program participant her vision for the next 21 years - Renee Carter, a senior student from Emerson School, spoke about how her confidence has grown through the course. Sarah Jane Haywood, one of the course co-facilitators, shared how she faces some of the challenges of being a young woman experiencing mental health issues. WDV is proud to have a board of management who are women with disabilities. At this year's AGM we said thank you and good bye to board member, Kumari Middleton. Members elected and welcomed new board member, Catherine Reidy. The eNews will have more on the WDV Board in coming issues. Organisations are increasingly recognising that if they wish to experience the benefits of diversity, they need to cultivate not just a diverse workplace but also an inclusive one. There is also growing recognition that leaders have a critical role to play in achieving this. See more via the Diversity Council of Australia. Members of Victoria's Parliamentary Committee of Family and Community Development visited WDV this week. The Committee is undertaking an inquiry into abuse in disability services. WDV has made a written submission and presented at a Melbourne hearing. The Committee members were interested to speak about what services and state government can do to support the safety of women receiving disability services. PHOTO - FRONT ROW: Emma Kealy (Member for Lowan) Keran Howe (WDV), Maree Edwards (member for Bendigo West), Jen Hargrave (WDV). BACK ROW: Sharon Granek (WDV), Jane Oldfield (WDV), Suzanna Sheed (Member for Shepparton), Fofi Christou (WDV). The Conversation reports that Aboriginal women only make up between 2 and 3% of Australian females. But within 8 years the number of Aboriginal and Torres Strait Islander women entering prison has soared from 21% of all women prisoners to 35%. Why? A recent NSW study find that Aboriginal women with disabilities are being let down by human services, and "they are landing in the criminal justice system because of serious policy and service gaps." This article has heart-stopping data on incarceration rates, and points to ways to reduce this discrimination. The Australian Government is inviting organisations to apply for Volunteer Grants. Funding is expected to be offered to around 5,700 organisations as a result of this process, with grants to be paid by 30 June 2016. Volunteer Grants enable small community/not-for-profit organisations to apply for grants of up to $5,000 to purchase small equipment items to assist their volunteers, assist with the reimbursement of fuel costs incurred by volunteers (and transport costs for volunteers with disability who are unable to drive), and contribute towards the cost of training courses and background screening checks for volunteers. Applications close 9th December. National research is to being done to gain an understanding into the main reason for why accessible car parking is required. Research results will be used to provide feedback, evidence and guidance on future developments of the provisions of accessible parking bays. Take the accessible parking SurveyMonkey questionnaire. Contact: Emilio Savle, Disabled Motorists Australia, (03) 9386 0413. Event registrations for International Day of People with Disability (IDPwD) are now open for people planning celebrations for the United Nations sanctioned day, celebrated globally on 3 December each year. Last year, almost 1000 events were held across Australia including music festivals, sporting events, fishing tournaments and barbecues. Organisers who register their events will receive free promotional packs. Registered events will also be added to an online community calendar. 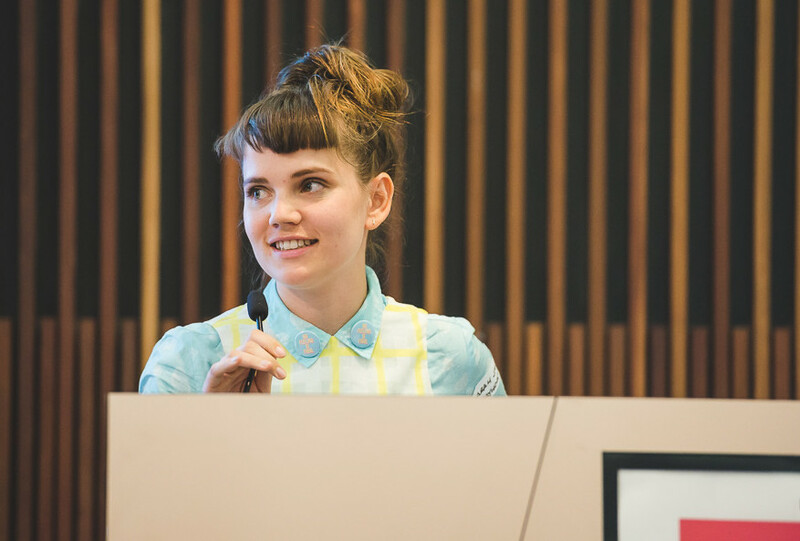 The ‘Why Self Advocacy Matters’ forum provides an opportunity for key decision makers to hear about exciting developments in self advocacy across Victoria, to talk with representatives of self advocacy groups and their supporters. One of the outcomes of the forum and Q&A is to put self advocacy fairly and squarely ‘on the map’ and to garner local support for self advocacy groups to ensure their ongoing viability. The FREE forum is aimed at key decision-makers including politicians, management and staff of mainstream and disability specific service providers, supporters or potential supporters of self advocacy, family members, business and community leaders and other interested parties. The forum features a Q&A. The Q&A is aimed at anyone and everyone who is interested in making sure people with a disability are actively involved in all aspects of these extensive reforms. The Self Advocacy Resource Unit (SARU) would very much welcome your attendance and input at the forum and Q&A. Details: Wed 25th Nov, 9.30am - 3.30pm, Melbourne. RSVP: Dean Dadson by Thursday, 19 November 2015. Connecting Women Across Gippsland is the inaugural conference created to bring women right across Gippsland together. Please note, tickets are $100. RSVP. Auslan interpreters are advertised to be there. Celebrate International Day of People with Disability with the Commissioner for Gender and Sexuality. Led by LGBTI people with disability, the FREE day is an opportunity for people to have their voices heard. Thursday, 3 December 2015 at the Wheeler Centre. RSVP by Wednesday 18 November 2015. Contact: Matt Dixon, (03) 9651 6226. STAR Victoria's 45th Annual General Meeting will be at 12:30 on the 25th November 12-30pm –2pm at Ross House, Melbourne. Contact Pam, 03 9650 2730. You are invited to the Brain Injury Matters AGM invites you to the 2015 AGM, 11:30, at Ross House, Melbourne. After the business has been completed, you are invited to make stars for the 1 Million Stars to End Violence which is a love and peace filled community project by artist Maryann Talia Pau. The aim is to bring people together around the world to weave 1 million stars for a display in Queensland Australia, 2018. These beautiful stars are symbols of light, courage and solidarity to end all forms of violence, including violence against women, bullying and racism. Disability support groups say the low funding rate for providing care threaten the success of the NDIS, claiming the $41 hourly rate on offer will barely cover costs and result in fewer services and less qualified workers. See the Age story by Rachel Brown, 25th Oct.
An Australian Housing and Urban Research Institute (AHURI) study found critical barriers and success factors for people with disability to move into housing which better suits their preferences and needs. Although the study focused on people with NDIS or other individualised support funding packages, its findings have broader implications for the general population of people with disability. The Summer Foundation has launched its latest report, 'Housing for Young People in Nursing Homes: A Report from a Social Finance Think Tank.' The report identifies ways to bridge the gap between the disability support pension and the cost of renting good, accessible apartments. Many people with disabilities would benefit from apartments they cannot afford to rent, apartments that are well located, well designed, and incorporate smart-home technology. Read more via the Third Sector. Are you a mother with autism? Would you like to meet other women who understand your experiences? Would you like to join a social group with other autistic mothers? find out what to do if there isn't enough money for the rent or the mortgage. Learn how to use Victorian human rights and equal opportunity laws to strengthen your advocacy to achieve better outcomes, improved services and greater access. Ideally suited to community advocates and self advocates. Register for this free Victorian Equal Opportunity & Human rights Commission training. Details: Thu 19th Nov, 2015: 9:30am - 1:00pm, Carlton. The Museum of Australian Democracy's Honour Board for the Campaign for Disability Rights is a place where you can nominate disability campaigners / advocates. On the honour board page you will see some familiar faces of women with disabilities, including Keran Howe. Some outstanding feminist male campaigners for disability rights are also honoured. You might like to check out the honour board or nominate someone you know.